John and I never truly thought that we would go back to a place, but when we decided to return to Paris, three years after our first trip there, we knew that the goal would be to achieve a better balance between wine bars and museums, cafe-sitting and “must see” checklists. Gare du Nord seemed a baffling labyrinth, even compared to the sprawling Charles de Gaulle airport, which at least possesses decent signage. Sleep-deprived, we arrived at the train station around 8am and spent an inordinate amount of time looking for the luggage check. In my Dramamine haze, the lockers posed a greater challenge than a Rubik’s cube and then John couldn’t figure out how to get the door open to leave the cage-like area where the lockers were. Miraculously, we found ourselves near Chaumont-Buttes around 9am (Damn our chipless credit cards! John’s French did him well in ordering a carnet of metro tickets). We followed a walking tour from an Eyewitness Guide book to look at houses in the neighborhood before entering the park. 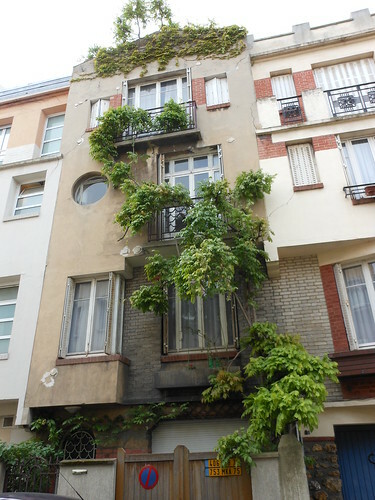 We saw impressive ivy and a lovely community garden on a hillside that looks out to Sacre Coeur. This gorgeous park in the northeastern corner of the city has the best features of public spaces designed in the Victorian era: faux Roman monuments and grottoes, water works, bridges, huge lawns. Gaggles of French children on field trips busily completed scavenger hunts, while scoffing teenagers hung out on the rocks at the park’s highest point. Meanwhile, older Asian women performed their morning exercises and all the joggers were out. 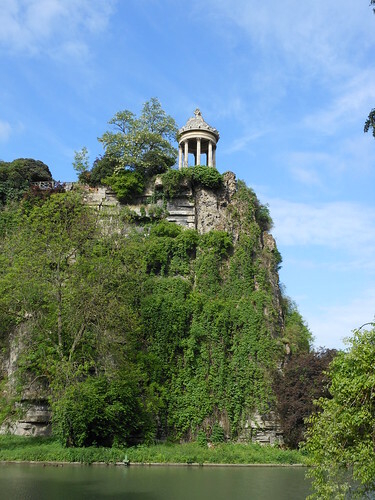 In the park’s large grotto, a woman was either practicing her operatic singing or had volunteered to provide atmosphere. And we saw not one, but TWO cats on leashes. No matter how bucolic a landscape, one always needs to meet that basic need: finding a toilet. Just outside of the park, we spotted one of Paris’s many self-cleaning units. I made the mistake of entering directly after a man had exited without realizing that the contraption goes into a cleaning mode after each patron. Before I knew it, the toilet folded up and water started gushing in from the floor. I was in such a state of shock and confused emotions (how will I get relief?) that I stood frozen in the hope that it might be a short-lived cycle. It was not. After two more waves succeeded in soaking my shoes and dampening my pants nearly up to the knee I managed to exit. No picture can fully capture the situation, but fortified as I was with so much Charlie Chaplin I laughed off the experience as something out of Modern Times. I eventually dried off and enjoyed using a hair dryer on my shoes when the opportunity presented itself about 4 hours later. Since we were in the northern part of the city, we again hopped on the metro and rode all the way to the Basilica of Saint Denis, the French equivalent of Westminster Abbey. It was once a Benedictine abbey, built in the 5th century and later rebuilt in the 12th century in the early Gothic style. The free brochure, from which I am getting all of this information, says: “Most of the kings and queens of France were buried here from the 6th century onwards.” In the crypt, we saw where the remains of Louis XVI and Marie-Antoinette lie, while the main level of the church is filled with amazing examples of funerary sculpture from the earliest recumbent styles to Renaissance monuments (such as the tomb of Louis XII and Anne de Bretagne pictured above). 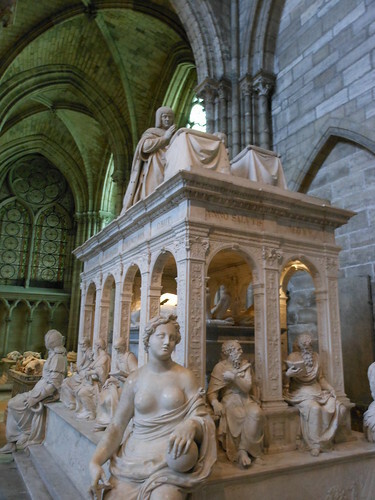 The tomb of King Dagobert (d. 639) is also here. The top floor was ours. John bumped his delicate bald head on the slanted ceiling so many times. Washing dishes and bathing had to be performing in a hunched position, but it was perfect otherwise. 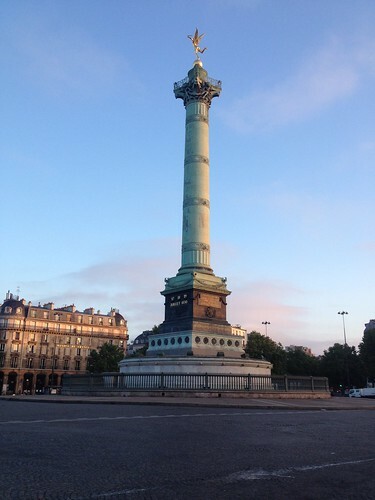 We chose to ignore the rumbles of hunger and headed back to Gare du Nord to pick up our bags and check in to our AirBnB place near the Bastille on rue de Charenton. We went on a short walk to orient ourselves around the neighborhood and ate lunch at Bistrot du Peintre (Av. Ledru Rollin) with its gorgeous Art Nouveau bar, cheesy music selection, and friendly wait staff. Our hearty meal — eggplant lasagne for me and saucisse fraiche for John accompanied by Cotes du Rhone wine — revived us for more rambles along rue de Charonne where we found a fabulous comic book store, BDnet, which must be a French chain. Nerds unite! John had no problem getting advice from the clerk and bought some books by his favorite désignateur, Boulet, whose books aren’t here in the US. After a break back at the apartment, we took off again in a different direction and followed the southernmost part of the Canal St. Martin from the Bastille to the Viaduc des Arts. 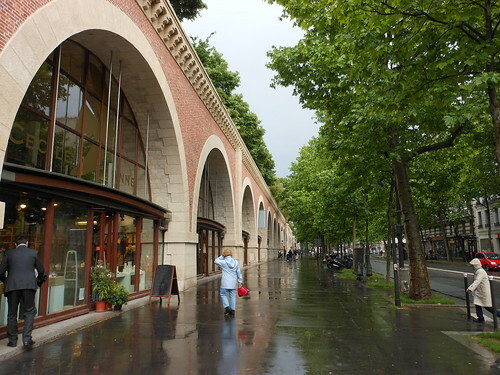 We spent a short time huddled under a bridge with other pedestrians trying to dodge the pouring rain, but soon it lightened up and, peering in the windows of the artisans of the Viaduc, we salivated over restored paintings, lamps that doubled as sculptures, and 900 Euro ukuleles. The Promenade Plantée makes use of the old railway on top of the Viaduc and inspired New York’s Highline. Again we saw lots of joggers, two boys practicing martial arts, and countless roses. Who’s this dapper gentleman? It was time for a good sit down, so we exited the promenade and found our way to Le Baron Rouge, a tiny wine bar by Place d’Aligre. I tried a glass of Petit Chablis and John a Chinon. I had not even the strength to bar hop. We walked down rue de Lappe, lined with dark bars (reminiscent of Bourbon Street without the strip clubs), but I wanted the sun. Feeling very tired and utterly defeated when I realized I’d forgotten a critical piece to our plug adaptor, I took a nap. John, meanwhile, scoped out the neighborhood and found us our first stop for the evening. On our street: the back of the Opera Bastille, a small hospital, a high school and metal stands plastered with EU-election posters. 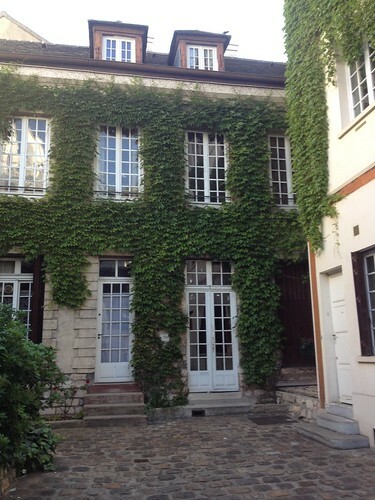 There was also Nebbiolo (67 rue de Charenton), owned by the enthusiastic Frederico. His adorable “Cave Italienne – Table Piemontaise” sold Italian wines by the bottle and had approximately 15 seats (including the bar). We sat at the bar around the corner from three Parisians in love with Aperol spritz. Frederico gave us two Italian reds to try and made sure we ate well with his specials: radishes and fresh ricotta, peppers with anchovy cream (for John only), fresh pasta and pesto. A young female relative helped in the kitchen and Frederico gave her pointers on how to make the perfect Aperol spritz (they must go through a ton of the stuff). I was so happy to have radishes! It reminded me of home. Knowing I didn’t want to venture far, John took me a few more doors down Charenton to Le China, one of the coolest bars ever. 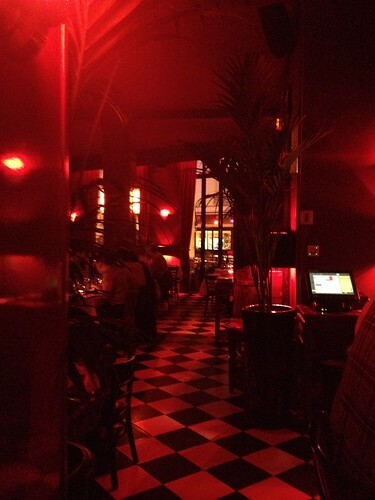 All the lights are red; there’s a 1940s vibe and a cocktail menu longer than the Homeric catalog of ships. I had my first Mai Tai ever – superb pineapple flavor! – and John drank “Hemingway’s Last Stand”. We were thoroughly entertained by watching the two bartenders make drinks. The girl was a novice and still learning what went in what, so we made sure to let her know that we really liked what she made for us. I was thrilled by the complimentary bar snacks: fresh cucumber and carrot sticks for dipping in a sesame-soy sauce flavored hummus (it may not have technically been hummus, but it’s the closest comparison). The next morning we visited the market at Place d’Aligre and bought apples, yogurt (quite challenging to pronounce in French), and croissants. We ate the croissants on a bench on the promenade and ate the yogurts back at the apartment. 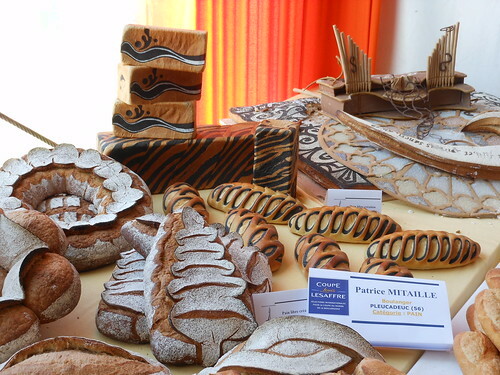 On a leisurely walk we went from the Bastille to Notre Dame where we stumbled upon “Le Fete du Pain”! Children were learning how to shape dough at one booth (here’s a girl with flour on her chin), while at another an old baker flirted with women by playing up the sensuality of his wares and teasing them with samples. The smell of all that bread was amazing! We visited the Archaeological Crypt of Notre Dame to see remains of Roman and medieval houses, before continuing our walk toward the Pantheon on the left bank. On the way we stopped in a tiny, jam-packed electronics store that had the just the thing we needed to charge our camera and phones. John shook his fist at the shrouded dome of the Pantheon, but he was easily consoled with beer at La Gueuze just down the street. I rested my feet and drank, what else, a gueuze. 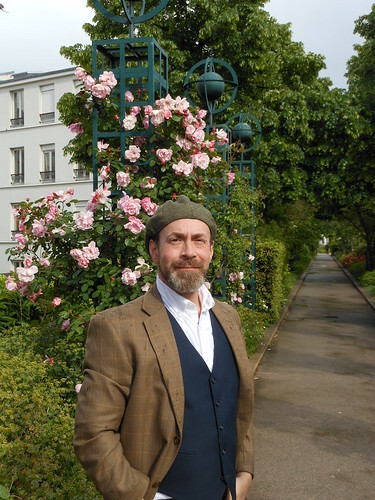 We rambled through the Luxembourg Gardens and then northward to a sandwich shop I’d heard about through the blog of chef and food writer David Lebovitz. Apparently Cosi is a hot lunch spot and we dutifully waited in line (there was no place to wait inside) for our “Cheesy English” (roast beef and cheddar) and “Naked Willy” (ricotta, zucchini, walnuts, and peppers) — quite an embarrassing order to place. We ate our sandwiches and apples from the market by the Seine and watched one of the sellers of vintage print materials (books, pamphlets, plates) try to catch an old magazine before it flew over the railing onto the quai below. He managed to collect it a few minutes later. 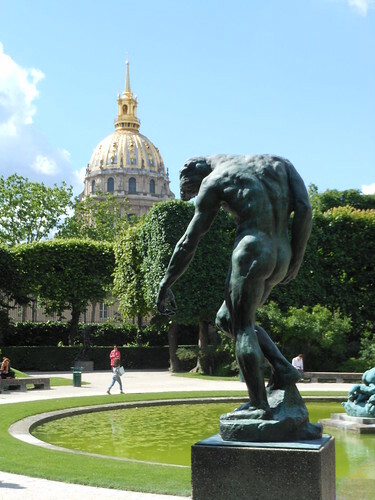 We visited the Rodin Museum a short distance away, where the gardens were the highlight. In the new building with the gift shop, the museum has a gallery for special exhibits. The temporary exhibition showed the parallels between Rodin’s sculptures and Robert Mapplethorpe’s photographs, namely their approaches to texture, light, and form. I’d only seen Mapplethorpe’s work in books, so it was a treat to see large prints of all the beautiful bodies. In the 18th-century mansion, smaller sculptures are on display, but the Hôtel Biron itself is so interesting in terms of its wall decorations and design that I marveled more at the mansion than at the sculptures. The mansion was also very hot, so we escaped to the large garden and sat to rest our feet. We saw a few people walk by into the very back of the garden, but they never returned. Perhaps there’s another exit, we thought! We got up to investigate. The back garden turned out to have lots of reclining lawn chairs — so that’s where they all went — they all went to sleep. We weren’t far from rue Cler, a mostly pedestrianized foodie street. We ate an eclair at a bakery that had a few tables outside (it was chocolate on chocolate and so rich), before visiting the cheese shop of Anne Marie Cantin around the corner. In this small, beautiful shop, we were not supposed to touch anything. I realized that I know nothing about French cheese and my mild fear of soft cheeses (they tend to be funkier than hard cheeses) started churning. I spotted a hard cheese that turned out to be delicious and we also bought a sampler of three cheeses (goat, blue, and something brie) and yogurt for the morning. Though the woman working in the shop was very kind and patient with us, we both were totally intimidated. The ride on the metro and subsequent naptime provided much needed rest. John slept a bit longer so I surprised him by arranging all the items for our dinner. 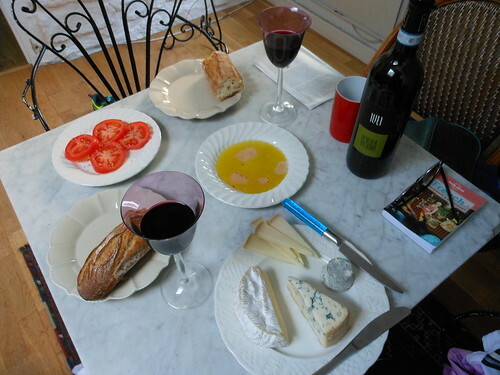 He bought a wine from Nebbiolo, one of the ones we tried last night, and somewhere along our adventures that day we picked up a loaf of bread. I found the tomato in our apartment, which also had olive oil, vinegar, and dried oregano. The goat cheese, the little round one in the picture, was so hard! We weren’t sure how to eat it. I had a music evening plotted for us around rue de Charonne. First we went to Le Hotel at the end of a cul de sac. The place had two rooms and we found two little cubes to sit on by the window looking on the street. We drank a white wheat beer, very refreshing, and felt like we were some place on U Street in DC. Lots of guys with beards and hats. We saw a cello and guitar set up on the tiny stage (about the size of my dining room table) only a few inches above the floor. Our scepticism melted into pure delight when the two guys started playing about 15 minutes later. The guitarist’s voice was a little like Jeff Buckley’s and the guitar and cello worked well together to produce atmospheric, dreamy rock. As it got closer to 9pm (still light outside! ), we moved to L’Atelier Charonne, a traditional jazz club with lots of seating for dinner. We sat at the bar where the super nice bartender made us feel at home. I was still hungry and ordered risotto with mushrooms and later for dessert we shared a mille feuille (Napoleon). John had an excellent Cote du Rhone rose! The Ben Toury trio played that night. What a good time! Piano, bass, guitar. Toury sang and played the piano like a demon and wore two tambourines on his right leg for keeping time They had a gypsy violinist friend in the audience who came up now and then. The music went everywhere — blues, New Orleans, gypsy jazz. Truly awesome. I swear I saw a guy who was hanging out at Le Hotel appear at L’Atelier Charonne for his shift. He changed his earring from a flashier hoop to a discrete stud. I’m sure of it. 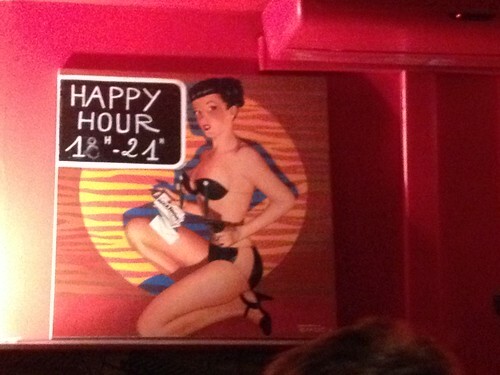 We ended the night at La Mécanique Ondulatoire, where a punk band was at it downstairs with a 10 euro cover. We stayed in the upstairs bar with the cool retro furniture and Edelweiss beer. We got ourselves to bed not too late. 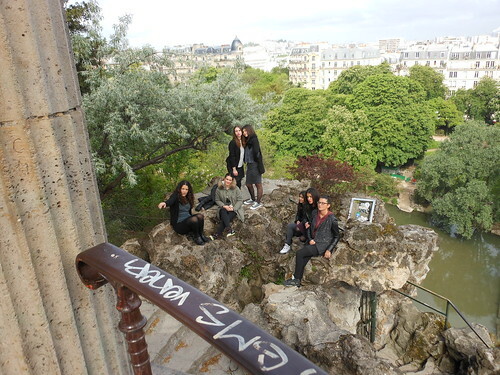 The next day we would be visiting Reims! 2 Cats on a leash!!! I would have loved to have joined you guys, sounds like an awesome trip so far.